AxxonSoft, one of the largest global security developers and the Russian leader on the market for smart integrated security and video surveillance systems, is marking its tenth birthday this year. The company has enjoyed uninterrupted growth thanks to its bet on innovation and unique approach to focusing on client needs. This well-chosen development strategy paid off in 2010, when AxxonSoft came out on top of the Russian market with 60% market share. At the ISC West 2013, AxxonSoft will celebrate its tenth birthday alongside its partners, friends, and clients. ISC West will be held from 10 to 12 April 2013 in Las Vegas (USA). The exhibition is the largest security industry event in, bringing together leading corporate innovators and major government and corporate customers from all over the world. AxxonSoft and its partners will hold a giveaway to award an exciting prize to a lucky winner each day of the exhibition. One winner will receive a ready-built video surveillance solution based on innovative AxxonSoft software and partner company IP cameras. The company's technology partners will help to celebrate AxxonSoft's anniversary: Pelco, Arecont Vision, Axis, 3S, Brickcom, Lilin, Vision Hitech, Dahua and others. 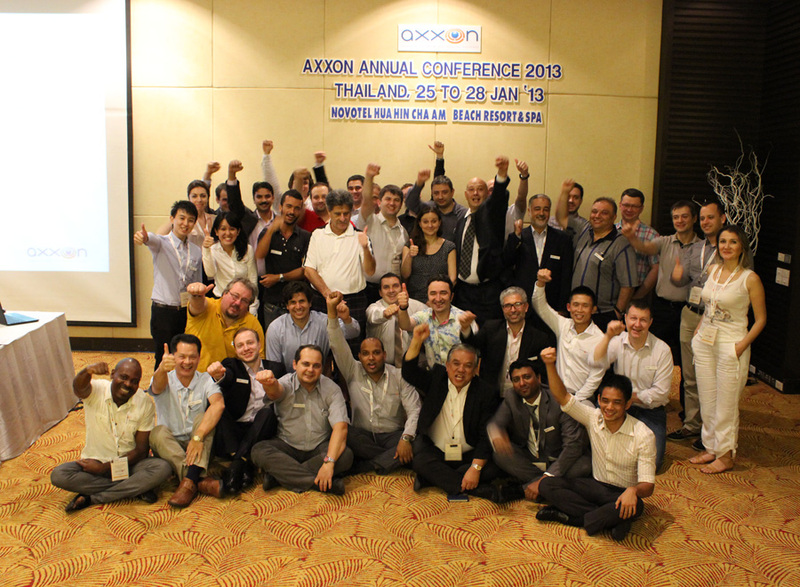 In its ten years, AxxonSoft has accomplished home-region market share unmatched by any other competitor worldwide. This has been possible thanks to the trust of clients, who have continued to appreciate the quality that stands behind AxxonSoft products. The company continues to serve those who depend on it, with short-term and long-term plans to continue refining its products and delivering breakthrough features. At ISC West 2013, AxxonSoft will present version 3.1 of its Axxon Next open platform video management software (VMS), which allows creating infinitely scalable video surveillance systems of any level of complexity. New features have been added to make surveillance even more effective in version 3.1. The Interactive 3D Map, for example, now supports immersion mode: a semitransparent video overlay is placed on the map, and objects in the frame are combined with their depictions on the building blueprints. Immersion mode makes monitoring more interactive, making it easy to see how in-frame object movement correlates with object movement in real space. Camera layouts can now be of any size or arrangement: users can configure them in any way they want. Viewing tiles can fit video of any aspect ratio. This is particularly convenient for panoramic images obtained by dewarping fisheye camera feeds. Conversion is performed on the video card, which allows placing any reasonable number of fisheye cameras on a single screen without overloading the client CPU. This function includes support for ImmerVision panomorphic lenses as well. Version 3.1 of Axxon Next also implements autozoom, which performs automatic digital zoom and following of moving objects. This is especially effective in conjunction with ePTZ units. There is one more new feature of note: Axxon Next has gained GreenStream technology, which among other features automatically picks the camera feed for monitoring workstations that best reduces CPU processing loads and bandwidth demands. As at past events, the company's stand will also feature some of its most popular vertical solutions: POS Intellect, ATM Intellect, Auto Intellect, and more. AxxonSoft will be delighted to see its friends and colleagues at the stand No. 39003 – stop by, we promise a fascinating time!